Hashes are commonly used in most Ruby apps so their performance characteristics are important. This post tells the technical tale of how hashes were significantly improved in MRI 2.4. A walk through designing a command line application in Ruby, from input to output and everything in between. Automatically know what’s broken and why with Rollbar. 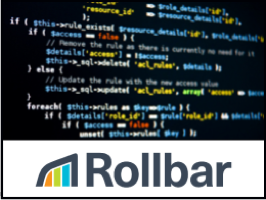 Rollbar instantly detects and alerts you (Slack, HipChat, Email) when code breaks. Get the stacktrace, code, user data to help you defeat Ruby errors. Learn more. An update on efforts by the Eclipse OMR team to be part of delivering Ruby 3x3, the goal of Ruby 3.0 being 3x faster than Ruby 2. A video that explains the big ticket items in the forthcoming Rails 5.1.0 (now available in beta) as well as how to use it already. A look at the challenges of ActionCable and a suggestion of how it could be improved using database transaction logs. Not usually recommended, using objects other than symbols or strings as hash keys is straightforward, and here’s an unusual but practical use case. Join us at SIGNAL for two days of technical learning with 2,500 people like you! Reek is a static analysis tool for Ruby. Did you know support for generating HTML docs for code was removed from Rails 5? Here's how to put it back. Learn to deeply understand and effectively apply RSpec’s advanced matcher DSL. A list of gems to potentially avoid and why. Use a YAML file with Bundler in place of a Gemfile along with some tools to update private gems more easily. Takes inspiration from ripl and Pry and has some interesting ideas. Now supports Windows as well. erubi is included in Rails 5.1, replacing erubis. PStore is a long-standing way to persist a hash to disk in Ruby.